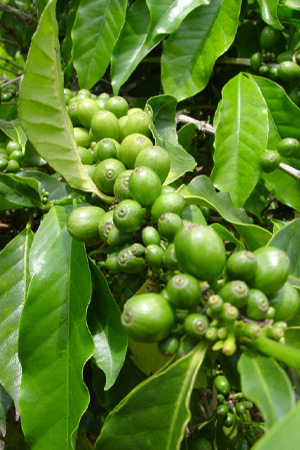 Green coffee is a popular coffee that is unroasted. These coffee beans are usually processed wet, and they are dried and finally milled. Green coffee beans are not roasted like regular coffee beans. One of the benefits with green coffee beans is that provides some interesting advantages to the traditional way coffee is delivered to the buyer. The fact is, that coffee beans stay fresher much longer in when they are not roasted. Many people choose green coffee because it will stay fresh for a long time and it provides a flavor and richness that coffee lovers are drawn to. Some of the most popular green coffee beans are: Costa Riccan Tarrazu, Colombian Supremo, Tanzanian Peaberry, Sumatra Mandheling, but there are more as well. When green coffee is being produced, it is the drying operation that is the most important stage of the process. Coffee that has been dried too long will become brittle and lead to many broken beans as they are hulled. Furtnermore, coffee that has not been dried sufficiently risk being too moist. This will in turn lead to rapid deterioration caused by the fungi and bacteria attacking the coffee. Green Coffee can easily be stored up to 1 year, if you keep it in a sack, in a dark, dry and cool place. Green coffee beans have very little taste be default. The good coffee taste is created during the roasting process. At 400°F (205°C) the carbohydrates and sugars inside the green bean begin to caramelize. This results in creating over 750 different components of flavours. Perhaps you have heard of the two main tasting sensations in coffee - acidity and body. Acidity is that "zinging" sensation on the tongue - not the bitter aftertaste associated with stale or poor quality coffee beans. When we talk about body, we mean the "feel" of the coffee on the tongue - the way it sits in your mouth. Coffees from Africa tend to have high acidity and low body, whereas coffees from South Asia usually have the opposite - low acidity and high body. Look at the overall appearance. They should have a similar size, shape and color. The producer of the coffee is then making sure the coffee beans are of the best possible quality before they are packed. The coffee beans should have the same (or very similar) color. This means that the beans have been dried in a consistent and thorough way, and that the beans came from the same batch. You can and should look closely at the beans before you buy. Try different kinds of beans to see what you like best. Coffee beans from different areas will taste different from each other. Good luck!